This is beyond obnoxious. We know that Zimbabwe, Bangladesh and China do such things – the SCUM of THE Third World., the nincompoops whom none can redeem unless their leaders are removed by their people. But this utterly incompetent CORRUPT dictator, Mamata Banerjee has now started arresting people for forwarding political cartoons on Facebook. Kolkata Police has arrested a Jadavpur University professor for forwarding a chain mail that contained a cartoon ridiculing Bengal's prickly chief minister Mamata Banerjee and her man friday, railway minister Mukul Roy, sparking outrage across the country. They were booked under IPC Sections 509 (word, gesture or act insulting the modesty of a woman), Section 500 (defamation) and Section 114 (abettor present when offence is committed) and Section 66 A(b) of the IT Act (causing offence using a computer) [Source]. We knew that totalitarianism was coming to India ever since Kapil Sibal threatened such things to protect his goddess Sonia Gandhi. But politicians are now starting to do this WITHOUT SEEKING PARLIAMENTARY AUTHORISATION. That is totally unacceptable. Change the Constitution to remove ANY REFERENCE TO Freedom of Speech. Else be prepared to be pummelled at the hustings. You fools who govern India, DO NOT ATTACK FREEDOM OF SPEECH. That's the only thing India now has. If that too is removed, expect MASS REVOLUTION. India will NOT TOLERATE DICTATORSHIP AND MUZZLING FREE SPEECH. Indira Gandhi learnt the bitter lesson a long time ago. I trust politicians haven't forgotten. Here's the cartoon, below. Please widely circulation this. 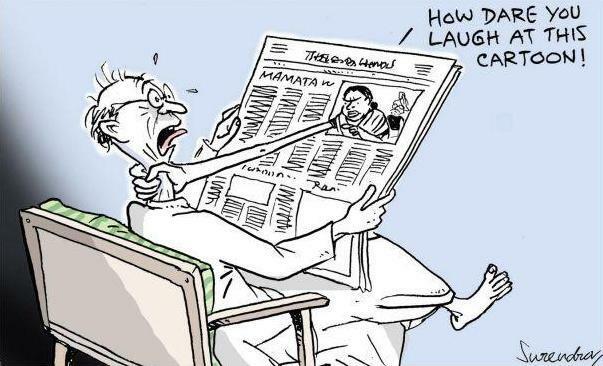 I can read the Bengali script and understand some of it, but I couldn't (at a glance) figure out what is going on in this cartoon. Nevertheless, spread it AS WIDELY AS POSSIBLE. I dare Mamata to issue an arrest warrant for me. Get me extradited to India for WIDELY circulating this on Facebook, and publishing on my blog. I take responsibility for this CRIME of freedom of speech. If we don't fight for freedom of speech in India, the lights of all freedoms may be permanently snuffed out. For 60 years we did not fight. We did not fight when they snuffed out property rights. We did not fight when they stopped people from engaging in the occupation of their choice. We did not fight when they funded religious bodies and religious events and divided us by religion. We did fight when enforced reservations and split India asunder. Now this is the last chance. If we don't fight now, expect the government to take this as a signal that Indians just don't care for their liberty. Unite. Speak up and be counted. Do whatever you can to fight this oppression. Show the government of India that YOU count. This entry was posted in India, Liberty, Politics. « Vikram Buddhi punished for no crime. Shahrukh Khan detained twice for no crime. It’s not far that she will realize it. We here in Bengal actually saw this coming right after she imposed restrictions on media and newspapers etc.